It’s all change for us this September at home, as Son2 heads off to start a three year BSc at university. He’s worked really hard and come out of his BTEC with top grades. He was fortunate to have very good support at his sixth form college from both Learning Support and also from his course tutors. Of course we supported him at home too as you would expect, because he often struggled to cope with deadlines, anxiety, and ASD issues, as well as fatigue and pain from his Ehlers Danlos syndrome. For young people with additional needs, it’s not just a case of picking the university you fancy, getting the grades and packing your bags. As well as the inevitable Student Finance England application, there is also the application for Disabled Student’s Allowance. I thought I would pen a few notes now as we have just had the assessment, so anyone about to go through the same thing or planning for future years can find out what it’s all about. Ideally you will have visited each uni you/your son or daughter has had offers for. For us, this hasn’t happened because Son2 has been so determined to go to his first choice, I could not persuade him to visit his insurance choice, where he was offered a place without an interview. Or a visit. His first choice did require an interview with his portfolio, and he spent not only quite a while there for the open day, even tolerating me speaking to the Learning Support department’s stand, he has been back for a university experience day, which gave him a good look at life on campus. At the university open days, I was pleased to see that every campus I have seen with both my sons have heard of an EHCP and would use it to help them wth his support, even though of course, it doesn’t have any legal status in higher education. I had been advised to get the support my son needs in place as quickly as possible, so as soon as my son had accepted the place, I made contact with the Disability and Dyslexia Services department to ask how to do this. They sent us forms via email to explain his needs, that we also had to get filled in by a relevant medical professional. The form was quite detailed and I knew no professional Son2 has had contact with would be able to answer in as much depth as I could. So I filled it in myself and then asked our GP to validate it. As we’ve known our GP since 2008, she not only knows my son, but she also knows and respects my own knowledge of his needs so, after a bit of a wait and a payment of £15, I got it back with the doctor’s official stamp that we needed. I sent this, along with a copy of his EHCP and confirmation of his medical diagnoses back to the university's Disability Services department. At the same time, I applied to Student Finance England online for the tuition and maintenance loans, as every student (or their parent) does. You say at the start of the application that the student has a disability. You then have to send in evidence to them by downloading an application form and sending everything that is asked for. At this point I didn’t have the university form back from the doctor, so I sent the EHCP and the medical evidence - letters with diagnoses etc - only to be told that this wasn’t sufficient! I figure that they didn’t actually want to plough through the EHCP to pick out his needs. Luckily, by this time, I had the university form back, so I sent a copy of that and, lo! it was fine. My main tip is that for everything you receive, scan it/photograph it and save them into a folder on your computer so that you can easily find and print them off should you need to. It's been invaluable here for me. We received confirmation by email and then had to follow a link to apply for a face-to-face needs assessment. Then, yet another form had to be filled in to see what kind of reasonable adjustments he would need. Before you start to worry that it’ll be a bit like a PIP assessment, as I did, you can relax. It’s much more informal. 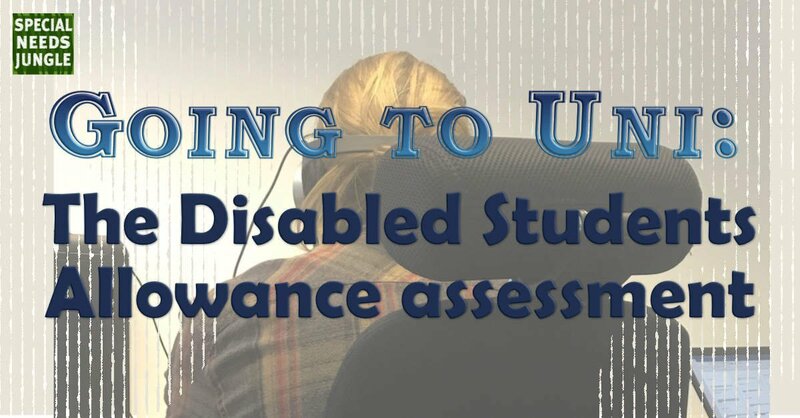 The assessment was pretty comprehensive, going through the needs listed and explaining how assistive technology could help, as well as exam allowances if needed. Packages can include the dictation software, Dragon Dictate, which the assessor assured us has come a long way recently. To help with the dictation, students get a wireless headset such as a Samsung Go. It’s obviously a lot better than my iPhone’s Siri, which I usually end up giving up on after it gets a simple dictated text message repeatedly wrong. Stupid Siri woman. Almost as irritating as the Sat Nav woman. Because of his EDS, he will also be getting a separate Ergonomic Assessment at home, as it will be possible for him to have a special ergonomic chair for his dorm room and a height adjustable desk. One of the biggest challenges for students with ASD is organisation. No problem! The DSA assessor showed us mind mapping software that works with Dragon Dictate. For lectures, if fatigue or handwriting difficulties are be a problem there is AudioNote software. The ideal way to use it is to have the slides for the upcoming lecture loaded up and then you start recording the lecture straight into the laptop. When the slide changes, you click the software and it moves the voice recording to the next slide so the lecture and the slides are recorded together. Then, when you go back to the recording, they will play back together. How brilliant is that? Of course, it may not work quite as well if the student forgets to click (thought the information will still be there) or sits right at the back, but we were told it was pretty sensitive. Reminder software is also available. Training is given in all the software provided. The DSA assessor can also, in her report, recommend that the university set up appropriate mentoring support to replicate what has worked in further education and this can be adapted as he gains confidence. For my son, the connection with the mentor is just as, if not more, important, so we were reassured that he would be able to change mentors if he wasn’t ‘clicking’ with who he had been assigned. For many students, with or without disabilities, having a good mentor can be the difference between finishing a degree successfully or falling through he cracks and dropping out - or worse. Luckily, Son2 won't be too far away from home. Son2 has a desktop at the moment, which won’t be much use for lectures. Students can get a laptop as part of their DSA, for which every student needs to pay the initial £200. It's pretty standard fare, so students (or their parents!) can pay to upgrade it to something more to their liking. They can also be provided with a printer/scanner if needed for their room. Students can also get an allowance for printer consumables and we were advised to set up an Amazon Prime Student Account, which is half the price of a usual Amazon Prime account and use the ‘subscribe and save’ facility, as this would make it easier to keep track of spending on ink that he can claim back. If he wasn’t in halls on campus, he could also get an allowance for taxis to get to lectures because of his EDS. Before term starts, many universities organise overnight stays for new students with additional needs to give them extra time to find their way around before everyone else arrives. Son2's halls are catered and we chose a larger room as he is likely to spend a lot of time there. One surprising thing we learned was that he would be able to pay the standard room rate because the larger room was as a result of his disability. Many young people, although they are capable of attending university, may not be able to manage legal or financial affairs. It's possible to get a legal power of attorney to step in and help if needed because of course once your 'child' is 18, your will be effectively shut out. We’ll have a post about issues around this in the next few months. What has left me utterly astonished is the ease with which this has happened compared to children who need help at school. Yes, there were forms to fill and all that, but no arguments over what he needed, no battles, no fights. They saw what his difficulties were and they provided for his needs. It's not a hand-out, it's levelling the playing field. Why can’t it be like this in schools? Of course, it’s all money related. But then, government has enough money for the things it wants to have enough money for, just not for adequately funding children’s education – and not just in special needs. Have just been through the exact same process alongside PiP for autistic son. Loads and loads of paperwork and repeat forms but YES the forms actually result in concrete support very quickly. Interested to hear more about power of attorney application though as I thought son’s consent would be sufficient to involve me in much of the prep (apart from bank stuff which he manages OK). Son has been at a brilliant residential special school since the age of 11 so I am really worried about the step down in support. He has been allocated 80 hours AS (specialist) mentoring and 35 hours academic mentoring support which totals 3 hours a week across a 38 week academic year. I feel hie may need some additional non-academic support to help with day to day problem solving. I am speaking to adult social care this week but not hopeful that will result in any support and wondering whether it is worth putting him through yet another assessment with no concrete result.